Pet ownership is one of the most rewarding responsibilities—aside from parenting—that you can take on during your lifetime. However, it also means that you need to be especially careful about certain lifestyle and decorative choices you make both inside your home as well as for your outdoor space. Obviously, you want your outdoor space to reflect your personal tastes while combining aesthetic beauty with proper functionality. 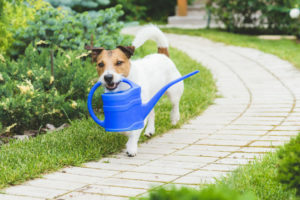 At the same time, though, you need to take the needs of your furry family member in mind when designing and creating the optimal pet-friendly garden that they can enjoy as well. Here are a few important garden care tips that you can use to create the perfect outdoor sanctuary for yourself and your pet! Fences aren’t just a good measure of keeping intrusive people and animals out of your yard; they’re also excellent mechanisms for keeping your pets safely inside the confines of your property. Whether you share a space with your neighbours or have wilderness right outside of your property line, it’s important to safeguard both your property and your pet. Oftentimes, cats and dogs tend to get curious and wander into other people’s yards, even if they’re not always welcome and this can make for some potentially hazardous situations for them. Sturdy fencing options such as iron or reinforced wooden fences are perfect for safeguarding your pets. When deciding on landscape ideas for your front and backyard, always keep in mind that certain grass, plant, and mulch varietals contain biochemical ingredients that are harmful for dogs and cats. Of course, different breeds of animals have varying physiological makeups and can therefore be susceptible to physical harm from different chemicals found in common gardening chemicals. Take this into consideration when selecting flowers, shrubbery, and trees for your garden and always thoroughly research which plants are acceptable options and which ones aren’t for your pet. Water features such as small fountains or ponds are an excellent addition to any garden because they incorporate the right blend of form and function. You can enjoy the calming sensation of listening to running water in the background as you sit in your outdoor space while your pet can take a sip of water whenever they feel thirsty on a hot day. On that note, you should also plan for some shaded areas in your garden so that on days when the sun is particularly strong, your pet has an area they can retreat to and cool down. Looking for more pet-friendly landscaping tips for your outdoor space? FOREVER GREEN LAWN & LANDSCAPE INC. are the expert outdoor space designers and property managers that your garden needs this summer. We can help you create the optimal outdoor space for you and your pet to enjoy together. To learn more about our business or to schedule a complimentary consultation with one of our garden installation experts, please contact us today!